The hottest selling and #1 style choice, this Messenger 2D Bag sports a sense of boldness. Perhaps you too can go far in life with this bag after all you can sling it on and go. It offers a convenient adjustable shoulder strap to take as you please, and easy access via the dual button straps to dig into your valuables. 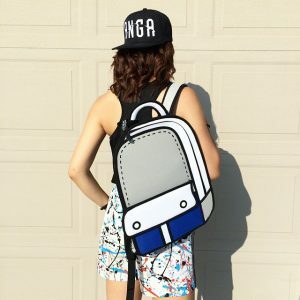 Take this 2D bag anywhere! 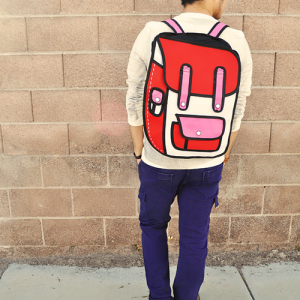 I’ve gotten compliments on this bag almost every time I’ve taken it out! It’s cartoonish and trippy looking, pretty eye catching. I wear it with the bottom unzipped so it isn’t completely flat, but it still looks flat even with my stuff in it. It fits my wallet, keys, lip gloss, and a tablet or fairy flat book. I have to fish around a little to find stuff because it’s so deep, but I have to fish around in every bag I have. There’s a phone pocket on the outer back that perfectly fits a large smart phone. The strap is sturdy and the bag seems well made. It’s fairly large and flat, so I notice it flapping against me sometimes when I’m walking around, but it usually isn’t bothersome. Would definitely order another one! 1. One main compartment great for a tablet, small notebook, magazine, clothes. 2. Secondary compartment for smaller items such as your phone, makeup, cords and more. 3. Outer water resistant canvas material. Made with vinyl on the inside. 4. Convenience of sling and go. 5. Amaze and WOW people everyday with your bag. 6. WILL FIT A MAC BOOK AIR 11″ PERFECTLY AND OTHER 11″ LAPTOPS.